The official duties of Arkansas' Lieutenant Governor as described by the Arkansas Constitution are to preside over the Senate with a tie-breaking vote, to serve as governor when the governor is out of state, and to serve as governor if the governor is impeached, removed from office, dies or is otherwise unable to discharge the office's duties. The position of Lieutenant Governor was created in 1914, but Arkansas did not have anyone serving as Lieutenant Governor until 1926. Amendment 6 to the Arkansas Constitution was voted on by the general electorate in 1914, with returns showing 45,567 in favor of the amendment and 45,206 opposed. The Speaker of the House declared the measure lost because it did not receive a majority of the highest total vote, which was 135,517. In 1925, it was discovered that the Initiative and Referendum of 1910 amended this majority requirement so that only a majority of those voting on a specific question was required. So, in 1926, the 1914 initiative was declared to be valid and Harvey Parnell was elected Arkansas' first lieutenant governor. 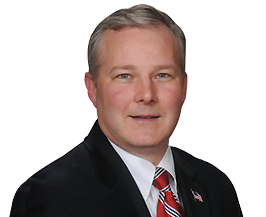 Tim Griffin (born August 21, 1968) was elected on November 4, 2014. Griffin is focused on working with Governor Hutchinson and the General Assembly to help move Arkansas forward. The tax burden on Arkansas families and businesses is too great compared to other states. We must enact bold tax reform to help us compete and grow jobs. Griffin believes we need a top-to-bottom review of each and every state agency to determine what it does well, what it does poorly and how it can do a better job of working for and with Arkansans and local governments. He also believes Arkansas needs to develop a path of excellence that educates and trains highly skilled workers, starting in high school and continuing in a two-year college or technical school. Having highly trained professionals will help attract more jobs to Arkansas. “I am focused on working with Governor Hutchinson, the Legislature and all Arkansans for a better Arkansas. It is an honor to serve the people of Arkansas,” says Griffin. From 2011-2015, Griffin served as the 24th representative of Arkansas’s Second Congressional District. In the 112th Congress, he served as a member of the House Armed Services Committee, the House Committee on Foreign Affairs and the House Committee on the Judiciary. For the 113th Congress, he was a member of the House Committee on Ways and Means while also serving as a Deputy Whip for the Majority. In Congress, he advocated for lower taxes and reducing the national debt. Griffin opposed Obamacare and had 100% NRA and Right to Life ratings. Griffin is serving in his 18th year with the U.S. Army Reserve, was deployed to Iraq with the 101st Airborne Division (Air Assault) and holds the rank of Lieutenant Colonel. He also served as U.S. Attorney for the Eastern District of Arkansas and Special Assistant to the President and Deputy Director of Political Affairs for President George W. Bush. Griffin grew up in Magnolia, a fifth generation Arkansan and the youngest son of a pastor and teacher. He graduated from Magnolia High School, Hendrix College in Conway and Tulane Law School in New Orleans. He also attended graduate school in history at Pembroke College, Oxford University in Oxford, England—the second Pembroke College alumnus to serve as Lieutenant Governor of Arkansas. Lieutenant Governor Winthrop Rockefeller was also a Pembroke College alumnus. His wife Elizabeth is from Camden, and they currently live in Little Rock with their two children, Mary Katherine, 6, and John, 4. They are members of Immanuel Baptist Church of Little Rock. Mark Darr (born July 3, 1973), was born in Fort Smith, Arkansas. He is a graduate of Ouachita Baptist University. Darr was elected Lieutenant Governor of Arkansas on November 2, 2010. Lieutenant Governor Darr worked with the Legislature to enact Senate Bill 221, the Arkansas Financial Transparency Act, which created an online checkbook for Arkansas. On February 1, 2014, Darr resigned from office. Bill Halter (born November 30, 1960), a fourth-generation Arkansan, was raised in North Little Rock. He is a graduate of Stanford University and a Rhodes Scholar, receiving a degree in economics from Oxford University. Halter joined the Clinton administration in 1993, serving in the Office of Management and Budget (OMB) in the Executive Office of the President. President Clinton appointed him as Deputy Commissioner of Social Security in 1999. He later served as Acting Commissioner of Social Security. A Democrat, he was elected to a four-year term as Lieutenant Governor on November 7, 2006. While in office, Lieutenant Governor Halter served as Southern Region Chair of the National Lieutenant Governors Association. Winthrop Paul Rockefeller (born September 17, 1948), in New York City and was educated largely in Switzerland, France and Great Britain. He was a graduate of the ranch management school at Texas Christian University in Fort Worth, Texas. He was elected Lieutenant Governor in a November 1996 special election triggered by the resignation of Governor Jim Guy Tucker and the promotion of then-Lieutenant Governor Mike Huckabee. Rockefeller was subsequently re-elected in 1998 to a full four-year term, receiving 67 percent of the vote. Rockefeller was elected once again in 2002 with 60 percent of the vote. Rockefeller had announced his candidacy for governor, but on July 20, 2005, however, he bowed out of the race, citing myeloproliferative disease, a blood disorder that could have developed into leukemia if left untreated. Rockefeller underwent unsuccessful bone marrow transplants at Seattle, Washington's Fred Hutchinson Cancer Research Center in October 2005 and March 2006. He is survived by his wife, Lisenne Dudderar Rockefeller, whom he married in 1983, and by eight children, three from his first marriage, to Deborah Cluett Sage, which ended in divorce in 1979 after seven years. Mr. Rockefeller's mother, 90, who moved to Arkansas from Manhattan in 2005, also survives him, as do a stepsister, Anne Bartley of San Francisco, and a stepbrother, Bruce Bartley of Little Rock. Mike Huckabee (born August 24, 1955), minister, was born in Hope, Hempstead County, Arkansas. A graduate of Ouachita Baptist University and an ordained Baptist minister, he pastored Beech Street Baptist Church in Texarkana, Arkansas, and served as president of the Arkansas Baptist State Convention in 1989 and 1990. A Republican, Huckabee challenged but lost to veteran U.S. Senator Dale Bumpers in the 1992 election. In 1993, Lt. Gov. Jim Guy Tucker assumed the office of governor following Gov. Bill Clinton's election to the presidency of the United States. In a special election, Huckabee was nominated by the Republican Party and defeated the Democratic nominee. On July 15, 1996, upon the resignation of Governor Jim Guy Tucker, he became governor. He was elected to the post in November 1998 and re-elected in 2002. Jim Guy Tucker (born June 13, 1943) was born in Oklahoma City and raised in Arkansas. He graduated Harvard University in 1964 and earned a law degree from the University of Arkansas in 1968. He served in the U.S. Marine Corps Reserve and was a civilian correspondent in South Vietnam in 1965 and 1967. He served as a prosecuting attorney, Arkansas attorney general, and in the U.S. House of Representatives. He was elected lieutenant governor in 1990 and became acting governor in October 1991 when then-Governor Bill Clinton began his campaign for president of the United States. He served the rest of the Clinton term and then was elected to a four-year term in November 1994. Winston Bryant (born October 3, 1938), attorney, was born in Donaldson, Hot Spring County, Arkansas. After graduating from Ouachita Baptist University, he earned a law degree at the University of Arkansas at Fayetteville and a master of law degree from George Washington University. He began practicing law in 1963 and served as assistant U.S. attorney for the Eastern District of Arkansas. From 1968-71, he served as legislative assistant to U.S. Sen. John L. McClellan. He then practiced law in Malvern and was appointed Hot Spring County deputy prosecuting attorney. A Democrat, in 1972 he was elected to the 36th District in the Arkansas House of Representatives and was re-elected two years later. In 1976, he was elected secretary of state. In 1980, he was elected lieutenant governor, where he served from 1981-91. During his tenure, he served as chairman of the National Conference of Lieutenant Governors. He was elected the state's attorney general in 1990 and occupied that office until January 1999. Joe Edward Purcell, attorney, is the son of Edward L. and Lynelle M. (Cunningham) Purcell. Born in Warren, Bradley County, Arkansas, he graduated from Little Rock Junior College. Following service in the U.S. Army during World War II, he entered law school at the University of Arkansas and graduated in 1952. That year, he began his law practice in Benton, Saline County. Beginning in 1955, he served four years as Benton city attorney. In 1959, he become municipal judge, a post that he held until 1966, when he was elected attorney general as a Democrat. He was re-elected to that post in 1968, and two years later he was an unsuccessful candidate for the Democratic nomination for governor. He was elected lieutenant governor in 1974 and re-elected in 1976 and 1978. He served as acting governor January 3-9, 1979, when Governor David Pryor resigned to take his seat in the U.S. Senate. Actively involved in a variety of civic affairs, Purcell did not seek re-election as lieutenant governor in 1980. Dr. Bob Cowley Riley (September 18, 1924 - February 16, 1994), educator, the son of Columbus A. and Winnie (Craig) Riley, was born in Little Rock, Arkansas. Educated in the city's public schools and at the University of Arkansas (B.A., 1950; M.A., 1951; Ed.D.,1957), he was briefly in the insurance business prior to embarking on a career in college teaching, first at Little Rock University (1951, 1953-1955) and then at Ouachita Baptist University. A veteran of World War II, active in political, educational, and civic affairs, he entered politics as a Democrat and was elected to the state House of Representatives from Pulaski County in 1946 and re-elected in 1948. A member of the Arkadelphia City Council (1960-1966), he served as the city's mayor in 1966-1967. Elected lieutenant governor in 1970 and re-elected in 1972, he was defeated in his effort to win the Democratic gubernatorial nomination in 1974. As lieutenant governor, Riley served as acting governor in the interim (January 2-14, 1975) between the resignation of Gov. Dale Bumpers, who entered the U.S. Senate, and the inauguration of the new governor, David Pryor. Returning to Ouachita Baptist University, he resided in Arkadelphia until his death. Maurice L. Britt (born June 30, 1919), manufacturer, the son of Maurice Lee and Virgie (Oliver) Britt, was born in Carlisle, Arkansas, and grew up in Lonoke. An outstanding high school athlete, he attended the University of Arkansas on an athletic scholarship. His nickname, "Footsie," derived from his size 13 foot. Following graduation in 1941, be briefly played professional football with the Detroit Lions. Called into military service in December 1941, he suffered the loss of his right arm in February 1944 and received the Medal of Honor and the Distinguished Service Cross. Britt retired from active duty on December 31, 1944, and entered the University of Arkansas law school where he was a student in 1945 and 1946. He left law school to become associated with a Fort Smith furniture manufacturing company. In 1963, he moved to Little Rock, where he organized and headed the Beautyguard Manufacturing Company, which specialized in aluminum building products. Three years later, Britt waged a successful campaign for the office of lieutenant governor on the Republican ticket. Re-elected in 1968, he served as lieutenant governor during the tenure of Republican Gov. Winthrop Rockefeller. He decided not to run for re-election in 1970 and instead served as Rockefeller's campaign manager in his unsuccessful bid for a third term. Appointed district director of the Small Business Administration, Britt thereafter continued to be involved in a wide variety of civic and charitable causes.